Cover it all in a short amount of time on this 4-hour tour of Miami. Drive through the Art Deco District, see Biscayne Bay and the exclusive islands dotted with luxury waterfront mansions. Drive along Brickell Avenue, home to many of Miami's most expensive apartments and see why Coconut Grove is a favorite retreat of the rich and famous. Catch some shade under the swooping banyan trees of Coral Gables and end your tour will end with a visit to Little Havana where you'll feel like you've traveled to another country. Hotel pickup and drop-off from your South Beach hotel is included. After pickup from your South Beach hotel, your tour starts with a drive to the heart of the Art Deco District. Here, you'll be brought back to the golden age of Miami Beach with the fanciful pastel buildings with porthole windows, ship-like railings, sleek curves, glass blocks, shiny chrome and gleaming terrazzo floors. There are over 800 structures of historical significance, most built between 1923 and 1943. Next you'll cross Biscayne Bay which is the largest estuary on the coast of southeast Florida and the location of the Port of Miami. Admire the artificial and exclusive islands, dotted with luxury waterfront mansions. The causeway will take you to Downtown for a brief visit of Brickell Avenue. Known as the economic gateway of Latin America, it's also the home to many of Miami's most expensive apartments and condominiums. You'll see some of the iconic Miami skyscrapers, such as the Atlantis Condominium and “Millionaires’ Row”. The next stop is the lavish vegetation of Coconut Grove, Miami’s original neighborhood founded in 1873 by an eclectic mix of pioneers, artists, intellectuals and adventurers. Today, stars such as Madonna, Sylvester Stallone and many others have selected this peaceful waterfront side of Miami as their residence. The neighborhood’s distinct bohemian flair allows one to unwind and relax every day of the week and any time of the year. In Coral Gables, planned by George Edgar Merrick in the 1920s, you'll drive down tree-lined boulevards and winding roadways with giant swooping banyan trees. Inspired from a Mediterranean town with homes built from local coral stones, the old quarry is one of the most desirable and old-fashioned neighborhoods in the area. Home to the picturesque site of the Venetian Pool, with shoppers that flock to fine boutiques and specialty stores along Coral Gables' Miracle Mile. 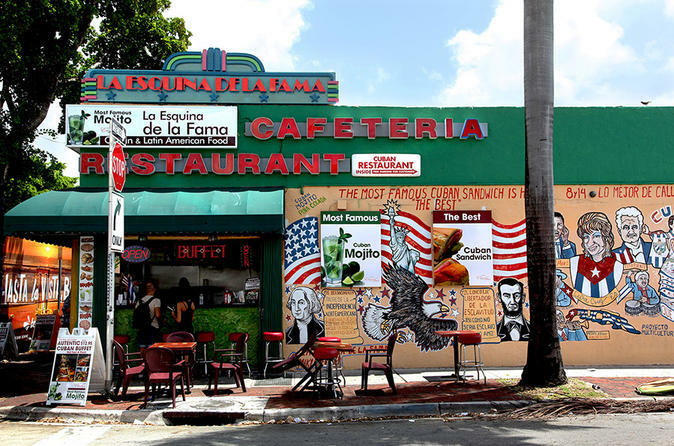 Last but not least, you'll visit Little Havana. You'll feel like you've traveled 90-miles without leaving Miami! Colorful murals, monuments to heroes past and present, aroma of Cuban coffee, elderly men playing dominoes and cigar rollers deep at work are only a slice of Cuban culture you'll experience. This 4-hour tour concludes with drop-off at your South Beach hotel.